On Screen: James Bond flies into Hamburg, Germany with the task of surveiling media mogul Eliot Carver. 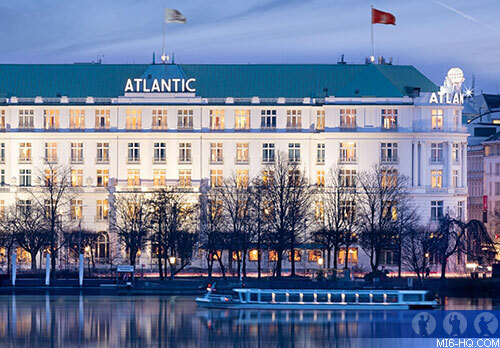 After a rendezvous at the airport with a very familiar hire-car attendant, Bond checks into the Hotel Atlantic on An der Alster, right on the lakefront. After freshening up – we presume! – he slinks his way into Carver’s black-tie launch party celebrating the expansion of the Carver Media Network. After a station break at the party, where Carver was embarrassingly cut off the air, Bond retires to his room at the Atlantic where he enjoys a nip or two of vodka before an unexpected guest drops by. The lush bedroom and expansive wood panelled room makes the perfect space to rekindle his old relationship with Paris, a jilted lover of the spy, who is now in a loveless marriage with Carver. Bond: You've made your bed. Paris: But I'm standing in your doorway. As Paris betrays her villainous husband, techno-genius Gupter uses surveillance tools to uncover the truth about 007 and his fabricated background story. Carver and Gupeter also discover the truth of the relationship between Mrs Carver and Mr Bond and send an efficient German assassin to Bond’s hotel room. Later, after infiltrating Carver’s press and discovering the missing McGuffin, Bond returns to the Atlantic, this time himself watched by Carver’s goons. He works his way through his extensive suite to find Paris dead on the bed, and news of her death already pre-recorded ready for tonight’s news. His final act before checking out via the window is to dispatch with Carver’s assassin who remained on the scene to kill Bond too. In Person: The full name of the hotel is Hotel Atlantic Kempinski, run by the Kempinski Hotels group which has over 100 years’ experience in hospitality. 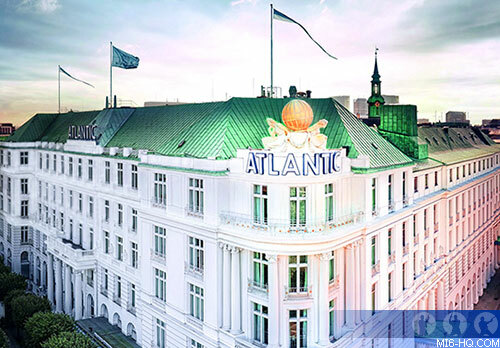 Opened in 1909 the Atlantic has a prime location in Hamburg, overlook the Alster Lake. The hotel draws its name from its original intent, to be a resting-stop for wealthy early 20th century tourists, who crossed the Atlantic by boat. It houses over 200 rooms and suites and 13 meeting rooms with warm inviting tones, tall windows and plush furniture. Many hotel rooms look out upon the lake, others look out on the courtyard. Highlights of the hospitality include the Art Deco Atlantic Bar, the Alstersalon buffet, Energy Clinic spa, and private cinema. Filming in Hamburg didn’t afford the crew the opportunity to shoot inside the rooms themselves and instead the club house at Stoke Poges golf course served as the interior of the hotel when Paris Carver drops by. Stoke Poges was famously a location for Bond some 30 years earlier when Sean Connery and Gert Frobe filmed the famous golf game for Goldfinger. 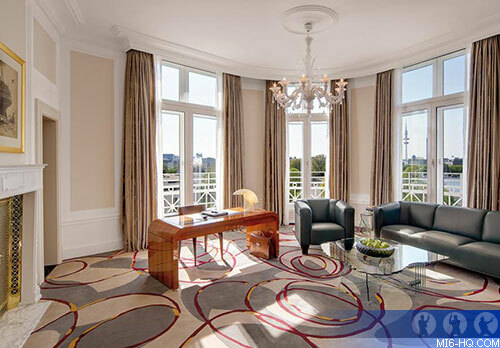 Still, many suites, including the presidential suite, in the real Atlantic are good enough for 007. 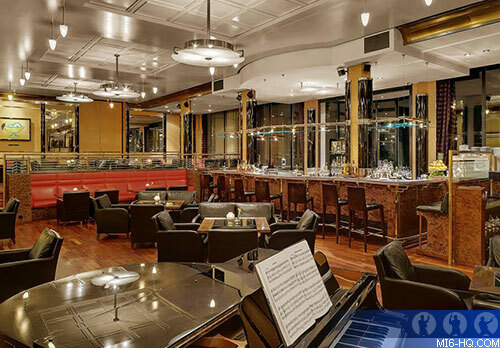 Through the years this hotel has maintained its five-star status and hosted renowned figures from president Charles de Gaulle to pop sensation Michael Jackson. 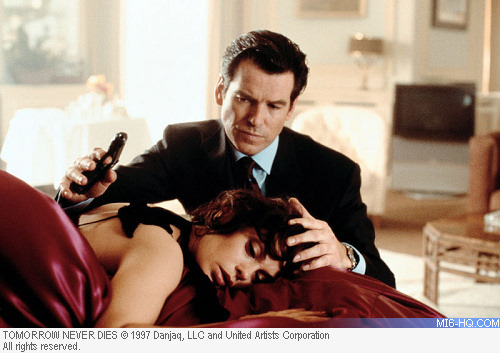 Photos MI6 updates the image archives with Teri Hatcher, who plays Paris Carver in "Tomorrow Never Dies"